SF7301 is a secondary-side Synchronous Rectification (SR) controller to drive SR MOSFET for improved efficiency. SF7301 can be applied in Continuous or Discontinuous Conduction Mode(CCM and DCM) and Quasi-Resonant(QR) flyback converters based on a proprietary Super- SRTM Control for SR MOSFET. The IC builts in a high precision reference voltage（1.25V） and an error amplifier to eliminating XX431 for cost saving. 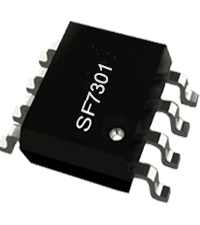 SF7301 integrates functions and protections of Under Voltage Lockout(UVLO),VDD Clamper, Primary-side MOSFET on time Expansion and Shrink Protections ,etc. SF7301 is available in SOP-8 package.